Competition picked up as racers challenged each other knowing that the series is drawing to an end. Overall standings in the 2017 Kenda Full Gas Sprint Enduro Series shifted last weekend. Jordan Ashburn is now leading by seven points over second place rider Steward Baylor. This is Jordan's second big win in a row after placing 1st in Round 4 of the series at Ohio. The track conditions got pretty bad as the weekend progressed with temperatures reaching 87 degrees and an average humidity level of 67%. Over the weekend the track began to dry up making it hard for riders to keep traction while creating dust that at times was almost impossible to see through. "I started Saturday with a big win in the first cross test. I managed to hold the lead the rest of the day over Stew and Cory. It came down to the last test. Stew and I were really close but I was able to edge him out for the days win." "Day two didn't start as well, the dusty grass-track was really tough to ride. I stayed constant and kept in the top 3 all day. For the final test, I was 4 seconds down from the leader and had to make a hard push to make up some ground. I ended up nudging him out by 3 seconds by days end with an overall win for the weekend." In the last RORR main event on July 1st and 2nd, Beta riders Jordan Ashburn and Nick Davis both put forth great effort. Jordan placed 3rd with heat times that were just a few hundredths of a second from 2nd place. Nick Davis came in a solid 4th place ending only seven seconds behind Jordan. The course was brutal with temperatures around the mid 80's. The competitiveness was so fierce that at times only fractions of a second separated racers from one another. The track itself transitioned from dust-ridden grassy knolls and flats, to mountainous forested terrain covered in sharp-jagged rocks and boulders. "Tough like RORR was not to disappoint this year, the track was very technical. I got off to a good start in the top 3 before making a mistake and dropping to around 7th place. I managed to make some passes and caught up with the third and fourth place riders, and then I battled with second place for the rest of the race. On the last lap I got stuck on a hill and couldn't make the pass coming into the finish, so I finished in 3rd just a mere 8 seconds from 2nd place. " "Today was tough. One of the hardest races I have ever done in my career. I got off to a good start, made a few mistakes, and fell back. But the last lap I put my head down and charged to 4th. I couldn't be happier after the tough year I have had with my injury." Jordan Ashburn takes 1st place at Full Gas Sprint Enduro! The races in Uhrichsville, Ohio last weekend started off with almost perfect weather conditions. Competition was fierce and the pace of each race amplified by each day. The gap between 1st place rider Jordan Ashburn and 2nd place rider Steward Baylor narrowed as the weather conditions worsened. Rider Jordan Ashburn stated; "My goal for the weekend was to put my head down and minimize mistakes. I couldn't have done it without all the support from my team." Nick Davis Takes 1st place in the 4th Round of the East Hare Scramble Championship Series, while Kyle McDonal took 2nd! Nick Davis pulls off a win after returning from a recent leg injury. His conditioning and practice seems to be paying off, while he prepares to return back to the GNCC series. Kyle McDonal ends the race in second place, but is leading the AMA East Hare Scramble Championship Series in points. Justin Wallis Takes 8th place in the WORCS Race event at Glen Helen Raceway. The scorching heat wave was expected to be too much for the riders last weekend at Glen Helen. The races had to be rescheduled for an earlier time than originally anticipated, while shortening the race time to an hour and a half. Wallis is currently sitting in 9th place overall for the WORCS Pro MC series. Beta USA's Rodney Smith has been promoted to head up the Beta USA race department. The AMA Hall of Famer and five-time GNCC champion has been working for Beta for the last 12 months as a rider coach and now will take over as the race team manager. Beta USA's President Tim Pilg comments, "It has been a huge benefit to our team ever since Rodney came aboard full time last season. His approach to racing matches our goals for the team so it made perfect sense to have him take over the team manager position." Smith is looking forward to developing the team and more, "I'm very excited to have this opportunity to run the Beta USA race team! I've been working & coaching the riders this year and now Beta has asked me to manage the team. I'm very excited to bring my experience I've learned over the years as a racer and champion as well as being inducted in the AMA hall of fame! I've had the chance to see & learn from my past managers, including Mike Webb, and now I'm looking forward to being able run my own team & to further give our racers the knowledge & experience to win some more championships for my riders, Beta, & myself." Beta's GNCC pilot Jordan Ashburn had this to say, "Being able to work with Rodney Smith is a true privilege. He is a former GNCC champion with lots of knowledge. I'm really excited for him to take charge of the Beta race team and help us achieve our goals." Smith will also work with EnduroX rider's Max Gerston, Ty Cullins, and Morgan Tanke as the EnduroX season begins in Las Vegas on August 19th along with the other team members. Gerston podiums in last weekend's AMA WHS (West Hare Scramble) Championship! Beta USA's Max Gerston finished 3rd in last weekend's AMA WHS (West Hare Scramble) Championship held in Redding, California proving the talented racer from Arizona is a contender for the title. The event had rain before the start which eliminated the dust and greeted riders with almost perfect conditions. Gerston is looking very comfortable on his 390 RR and is currently second in points. Gerston describes his race, "I had a great time at the Shasta Dam Hare Scramble. There was a lot of different terrain and my Beta 390 was the perfect fit for the job. The course was a 20 mile loop with everything from fast roads with huge water bars to virgin technical single track. It was a little fast for my liking but I still had a blast and ended up with a solid 3rd place finish, Braaap!" The Beta GNCC team was at round four of the popular series held in Morganton, North Carolina. XC1 racer Jordan Ashburn was in 10th after the first lap and continued to make a charge to the front however with the pace of the top five, Ashburn ran out of time and finished the three hour race in 6th. Ashburn had this to say, "Steel creek is a super tough track with huge braking bumps and steep hills. I didn't get the best start to the race. I came around the first lap in 10th place. I managed to make some passes over the next few laps and got to 6th. I was able to end the day in 6th place and get some good overall points." Teammate and XC2 specialist Nick Davis made his GNCC return after his dislocated leg at the opening round. Davis got the holeshot of the XC2 start and ran as high as second in the race however faded to an eventual 8th place at the finish. Not a bad result considering the extent of his injury. Davis had this to say, ""My Beta 250 RR got me off to an awesome start by grabbing the hole shot. From then on I ran with the lead pack for the first hour and a half then my leg got weak. I started having to sit a lot and hold on really tight with my hands. Which then resulted in my hands blistering very severely. But all in all for being about 70 percent and haven't ridden in weeks I will take the finish that we got. Lets bring on the next one!" Davis' teammate Drew Higgins also had a decent finish with a solid seventh at the line. Higgins had filled in for Davis, however team coach Rodney Smith was impressed with his performance and made the call to keep him in the series. Higgins comments, "The race yesterday was held in the mountains of North Carolina, it was a race that I was looking forward to. My race started off good, I was about 6th or 7th heading into the woods. Not too long after entering the woods, I began to get super pumped up from my under gloves. I started to ride really tight and not flowing through any of the bumps and going the speed I needed to go. I dropped back to 9th for the majority of the race, and on the last two laps I made a hard charge and caught 6th. Wishing I could have made the pass, but had to settle for a 7th. My last two laps were my best feeling laps, after I finally got rid of the arm pump and started riding like myself. No excuses, the bike worked awesome. Wishing I would have been able to charge right from the beginning and go with the fast guys. But I know what to do next time for my hands, and I learned a lot today with race strategy and as a team we learned a lot about fuel mileage. My shoulder and back are feeling really good, so I'm ready to get home and get back to riding and get ready for round 5 in South Carolina!" Max Gerston will race the Glen Helen 2-Stroke World Championships this weekend aboard a special 300 RR set up for moto. The race will be a nice cross trainer for the EnduroX season coming up in August. Jordan Ashburn continues his podium streak! Ashburn describes his race, "Saturday started pretty slow, I had to be pretty cautious in the muddy conditions. The enduro test was pretty slick. I was able to finish the day with a 3rd place going into Sunday and almost steal a test win. Going into Sunday I was close to second. I battled times all day back and forth and ended up a mere 11 secs from 2nd overall. I'm looking to keep building steam and working hard!" This weekend the Factory Off Road Team's schedule is round four of the of the GNCC held in Morganton, South Carolina with rider Jordan Ashburn (XC1). Teammate Nick Davis (XC2) is returning after healing from his injury. Drew Higgins will join Davis in the highly contested XC2 class as well. In the West, Max Gerston will be racing in round four of the West Hare Scramble Championship held in Redding, California. Beta USA's team competed in four different events this past weekend. USA Factory rider Max Gerston and Beta support rider Kyle McDonal both finished second place at the AMA National Hare Scrambles East and West championships respectively while Morgan Tanke finished 6th in the Ironman (Ironwoman!) class at the Glen Helen 6-hour endurance race. Drew Higgins finished 12th at round 2 of the AMA National Enduro series held in Florida. Max Gerston explains his race, "I got off to a crummy start but was able to make some quick passes on the motocross track and worked my way into second quickly. The course was fast, slick, and flowy which perfectly suited the Beta 390. Once I learned the course I was able to put down some better lap times but it wasn't enough to get the win. I am happy to finally get the ball rolling in the series and carry this momentum into the following rounds. I had a lot of fun and ended up second place." Drew Higgins had an off day overall, "The day started off pretty good for the first test as I ended up 9th. Second test was amazing, the trail flowed and the markings were really good. The third test was a struggle for me, many of us got lost, and I ended up getting turned around on the trail and rode the same part of it twice. I figured they would throw it out so I kept pushing the rest of the day knowing my day wasn't over. The fourth and fifth test were similar in terrain, and the sixth was very tight. I felt good in the tight stuff and could pick up a few seconds for my overall finish. The end result was 12th on the day, and I'm ready to improve on that result at the next round." Kyle McDonal comments, "The race was a lot of fun, I definitely had to take my time through some sections and pick good lines. I made the pass for second about three quarters of the way through the first lap and Wally (Palmer) had a good lead already. He was riding too good for me to make up any time on him. Overall it was a good race for points at only the 2nd round of the championship. I feel really good about the race and can't wait to show my progress in the upcoming races." Morgan Tanke had a fun yet enduring race, "Racing for 6 hours straight is no joke! The first half of the race seemed to go by pretty quickly but the 4th hour started to take its toll on me when the track was deteriorating. I was able to ride a steady pace and regain some energy to put on a charge at the end. Finally the end was near with an hour to go, I picked the pace back up and finished strong beating out 18 other riders!" This weekend the Factory Team's schedule is round three of the GNCC held in Sparta, Georgia with riders Jordan Ashburn (XC1) and Drew Higgins (XC2) filling in for injured Nick Davis. In the West, Justin Wallis will be racing in the round six of the WORCS series held in Las Vegas, Nevada. Higgins earns a top 5! Beta USA's Drew Higgins finished in fifth place at round 2 of the GNCC series held in Palatka, Florida this past weekend. Filling in for the injured Nick Davis, the young Texan proved his fitness and riding ability is on point. Higgins' teammate Jordan Ashburn hit a knocked down telephone pole on the first lap after running seventh in the XC1 class, ending his day. Drew Higgins explains his weekend "I was really looking forward to this opportunity to race in the GNCC this weekend, it was something that I have been working towards. Leading up to the race was awesome, Rodney put us through a couple days of conditioning which I feel helped. I really think that his additions to my workout routine are going to be beneficial. The race started off great, I nailed the holeshot and led for a little. During the first lap I got passed by a couple guys, I followed them to learn as much as I could. I was sitting in 5th after the first lap and stayed there pretty much the whole race. I passed and got to fourth place for one lap, then got stuck back in fifth when I pitted the second time. After the pit I rode smart and tried to minimize the mistakes to end up 5th. The bike worked amazingly all day long, I was very pleased with the suspension. My suspension tuner Bryce Rivera has it spot on and I'm really glad he is now working with the team." "I found myself off to a bad start early on. I was close to the back and the dust had us to a near stand still. It started pouring rain halfway through the first lap, so the conditions changed very quickly, and I was able to work my way to 7th place on the first lap. I suffered a major get off directly behind the pits clipping a telephone pole that was sawed off 5 feet above ground. This ended my day in a hurry landing head-first and obtaining a nice knot on the head." explained Ashburn. Factory rider Justin Wallis raced round 5 of the WORCS series in Lake Havasu however suffered a rare mechanical failure during the race and not be able to finish the race. This weekend the Factory Team's schedule is round two NEPG help in Ormond Beach, Florida. Drew Higgins will try and put his Beta 300 RR on the podium. In the West, Max Gerston will be racing in the round three WHS held in Gorman, California. GNCC round one race report! "Round one of the GNCC didn't go as well as I expected. I took the lead on the first lap and was able to come around in the front. I started to struggle with my bike setup on the track and I wasn't feeling comfortable as the race pace stepped up. I am going to try and make some slight changes on my setup this week to be dialed in for this weekend's round 2." explains Ashburn. Nick Davis describes his race weekend, "My Beta 250 RR had me off to a great start sending me to the top 10 out of 40 racers on Sunday. It was very hard with the dust to get ahead, but we managed pretty well and was able to get all the way up to top 5 on the second lap. I was heading up to pass for 4th (Ty Tremaine) when everything fell apart, I hit a hole which kicked me up into a section of trees. I ended up needing a life flight out of there. I dislocated my hip and I have a fractured T1 in my back. It will take a few weeks to heal up but I hope to return for round 3 in Georgia. Thanks for everyone's thoughts and prayers." Next on the Factory Team's schedule is round two of the GNCC series this weekend, known as the Moose Racing Wild Boar held in Palatka, Florida. In the West, Factory rider Justin Wallis will be racing at rounds 4 and 5 of the WORCS series in Lake Havasu, Arizona, a race which he won last year. 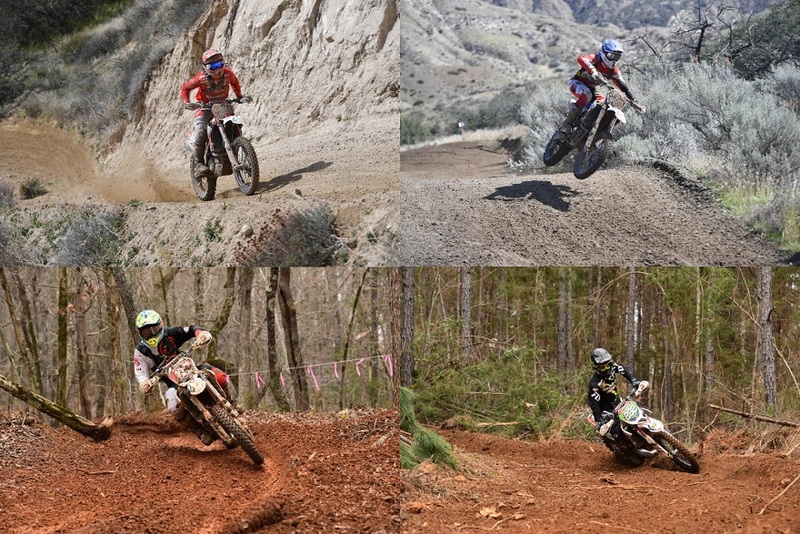 Beta USA's GNCC specialist Jordan Ashburn finished in third place at Round two of the Full Gas Sprint Enduro held in Monticello, Georgia this past weekend. The Tennessee racer continues to improve his speed at the two-day events and is becoming very comfortable aboard his Beta 430 RR. test was super dusty and sketchy. I found myself picking my bike up in the second test from sliding out in a corner. At the end of the day and with the scores all added up I finished in third place for the weekend." explains Ashburn. Ashburn's teammates Drew Higgins and Nick Davis finished 8th and 13th. Higgins posted his best finish so far this season and is using the series as a cross training tool for the National Enduro Series. Drew Higgins describes his race weekend, "The race for me this weekend went awesome, I felt like I'm starting to get my speed near where I want it to be to go for top 5's and podium finishes. The race on Saturday went good, I didn't have anything crazy happen, but stayed consistent all day and finished the day in 10th. They ended up running the cross test four times, and the enduro test only twice because of mud, which kind of hurt me because the cross test was mainly motocross. But I did the best I could and my times were still pretty close. Sunday I found my groove early in the day and started moving up in the overall. There was four enduro tests today, and only two cross tests, so I felt more confident in my speed in the woods to be more competitive with everybody. All in all the weekend was a step in the right direction for me, and I'm very happy with the new suspension. I'm feeling really confident on it now, and ready for the National Enduro on March 19th." Next on the Factory Team's schedule is round one of the GNCC series this weekend known as the Big Buck held in Union, South Carolina where Jordan Ashburn and Nick Davis will duke it out to be the first Beta rider to win a GNCC in the XC1 or XC2 class. Beta riders vs. muddy race courses! Beta USA had two of their racers competing in different events yet both were a mudfest! WORCS racer Justin Wallis aboard his Beta 430 RR at Round 3 of the WORCS Series held in Taft, California finished ninth while his teammate Max Gerston placed 6th aboard his Beta 300 RR 2 stroke at the AMA National West Hare Scrambles. Heavy rains in Taft the night before the race turned a perfect course into a sloppy mess. While the racing was still action packed, it proved to be a tough event as the mud challenged many of the riders. Wallis used his Kenda Southwick tires to his advantage however a slow start from the beginning eliminated his chances for a podium finish. Round 3 of the AMA West Hare Scrambles which was held at the Clear Creek riding area in Coalinga, California where Max Gerston did pretty well despite the muddy conditions along with some goggle issues finishing the race in 6th place. "The race was super sloppy and nasty. It was freezing cold and raining for the 3 hour race making it a brutal one. I pulled a holeshot and learned the course the entire race. I dropped back to 5th after many goggle issues and a few tip overs. I had enough sand in my eyes to build a motocross track at this point. My 300 RR suited the terrain well and was solid throughout the race." Gerston explains. Team Manager Tim Pilg comments, "Both our racers struggled with the muddy conditions. There were two separate events however with the amount of rain we have been getting here in California, they were both very muddy. It was a tough weekend for sure however I am confident in my team and what they are capable of." Next on the Factory Team's schedule is round two of the Full Gas Sprint Enduro held in Monticello, Georgia where team members Jordan Ashburn, Nick Davis, and Drew Higgins will do battle. Ashburn on the podium at Sprint Enduro! Nick Davis struggled early on in the tests, however began to regain his speed finishing strong at the end. The GNCC XC2 racer picked up the pace as the days went on. "I had a decent weekend. Struggled a little with the sprint pace, these boys are fast and with me never doing these races before I was a little off pace. I can't thank Rodney Smith and Zack Huberty enough for all they did and helped me so much with advice and over seeing my bike. I will be ready and stronger for the next one. I can't wait!" Davis explains. Out in the West, Beta racer Joe Wasson had a day he would rather forget. Racing Round two of the National Hare & Hound Championship in Alamogordo, New Mexico. Wasson was primed and ready for the event however a bad fall at the beginning of the race forced Wasson into looking for help on the course with a broken arm and a severely dislocated hand. Wasson was transported to El Paso, Texas where he received surgery on his arm and hand and is recovering. Wasson will be out of action for an undetermined amount of time waiting for his arm and hand to fully recover.